Some readers took issue with yesterday’s post that characterized a carbon tax as a terrific but politically unlikely proposal, after the Obama administration shot down the idea last week. Putting a price on carbon emissions is, after all, generating renewed interest from across the ideological spectrum. Notably, the libertarian American Enterprise Institute is co-sponsoring a forum on the issue today with the left-leaning Brookings Institution, Resources for the Future, and the IMF. 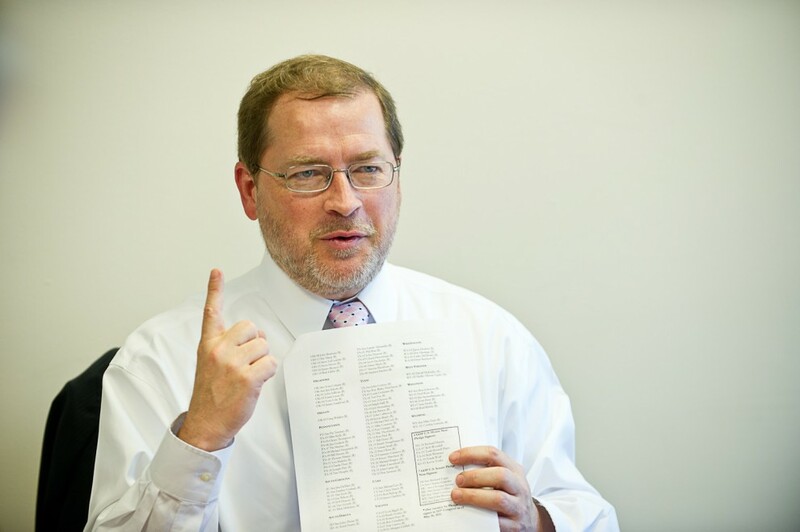 And yesterday, Grover Norquist told the National Journal that the blood oath he extracted from a majority of members of Congress not to raise taxes wouldn’t be violated by a carbon tax — if it was accompanied by lower income taxes. Apparently it also infuriated the American Energy Alliance — the political arm of the Institute for Energy Research, a think tank devoted to the promotion of fossil fuel development that’s funded in part by the ultra-right Koch brothers and their donor network. Well, that’s a quick turnaround from saying that it wasn’t a bad idea. The Obama administration has stated that, despite rumors circulated by British bankers, it was not planning to introduce a carbon tax. That assurance isn’t enough, however, for another Koch-funded think tank, the Competitive Enterprise Institute. CEI is suing the government to gain access to emails, just to make sure the Obama administration is serious about failing to take the single most effective step to prevent catastrophic climate change. Republicans are in favor of cutting progressvie taxes and increasing regressive taxes. In 1983, we were told that increasing the regressive payroll tax would “Save Social Security.” Instead, the money was just used to offset income tax cuts. Now they want to use the environment as an excuse. Or not, because taking benefits away from younger generations that older generations promised themselves but were unwilling to pay for is the greater goal. Good sleuthing. It’s amazing to see this stuff unfold in real-time. Maybe Norquist’s funders should go back to dictating orders by private phone calls, rather than use a publicly-available newsletter. What were they thinking? There is just such a stigma about paying taxes in this country. And people wonder why the education system is falling apart and the road infrastructure is so poor quality and often worn out. The common good mentality is terribly lacking. Pretty amazing that Koch brothers can be so blatant about destroying American governance and justice with relatively no complaint. This isn’t about “progressive” or “regressive”. It’s about offsetting the real, quantifiable damage of carbon-based fuels. It’s economics at its most basic level. To be against a carbon tax is to be for the subsidized waste of a precious resource, and the reckless neglect of the environment. The tired old assertion is that the American people will never accept a tax on carbon emissions (even in exchange for rebates or cuts in other taxes), but here it’s pretty clear that powerful interests are terrified of what will happen if the people are ever given the choice. No such thing as selling “a little bit of your soul” to Big Oil, is there. This isn’t the fist time Norquist has engaged in sophistry, nor the most blatant. Check out the link for his uber-lame explanation regarding taxing marijuana.